US Army/Spc. 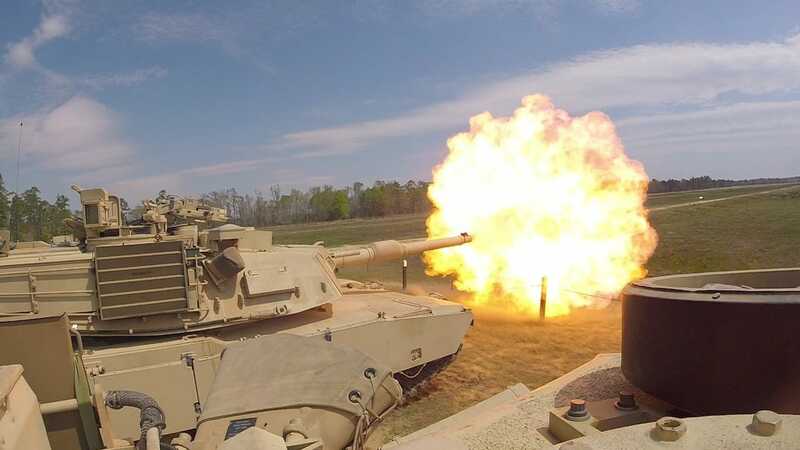 Leo JenkinsTroopers with Delta Tank Company, 6th Squadron, 8th Cavalry Regiment, 2nd Armoured Brigade Combat Team, 3rd Infantry Division, fire a main gun round at a target during unit gunnery, at Fort Stewart, Georgia, March 29, 2018. The US Army is boosting its presence in Europe, sending troops and tanks to reinforce NATO security and deterrence efforts at a time of increasing tension with Russia. But the US military is also grappling with a readiness crisis, and to address that problem while reestablishing a presence in Europe, the Army is looking to convert some infantry units to armour. 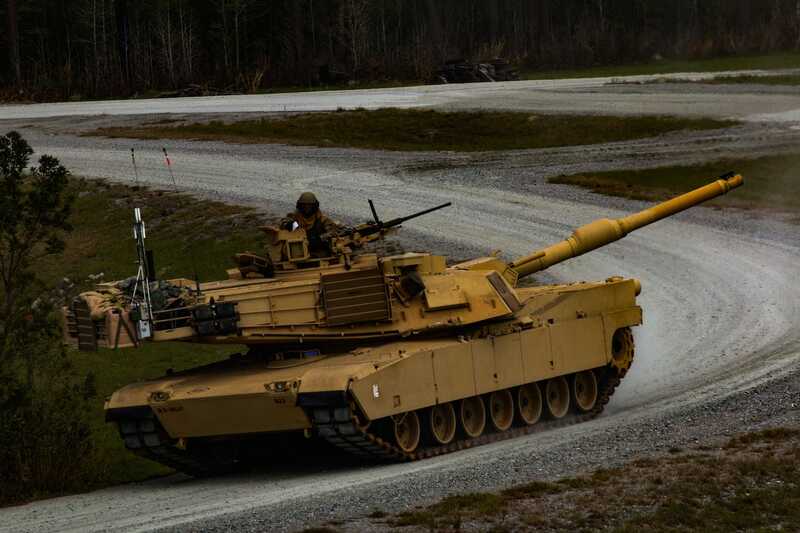 One such unit, the 2nd Brigade Combat Team of the 3rd Infantry Division, rolled out its new Abrams tanks at the end of March. 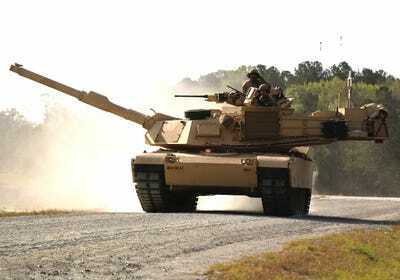 The Army announced the conversion in November 2016. The change-over began in summer 2017, and its completion was marked by a ceremony in October 2017. 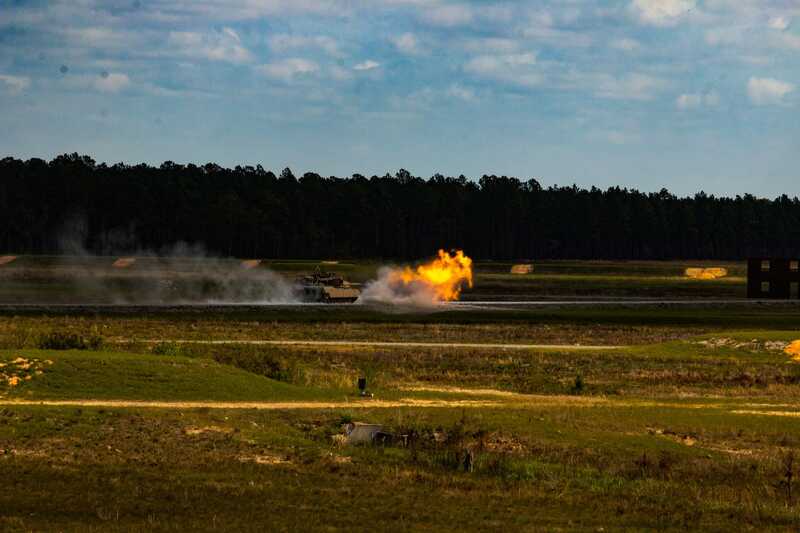 The brigade’s reorganization involved adding three platforms: the Paladin self-propelled howitzer, the Bradley fighting vehicle, and the Abrams tank. Between August and October 2017, Army engineers built a new, 2.8-acre concrete-pad motor park at Fort Stewart to accommodate the new vehicles. US Army/Staff Sgt. 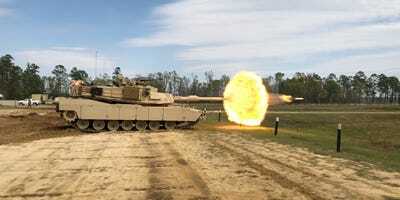 Nathan C. BerryA M1A1-SA Abrams from D Troop, 6th Squadron, 8th Cavalry Regiment, 2nd Armoured Brigade Combat Team, 3rd Infantry Division, moves to battle position during troop-gunnery qualification at Fort Stewart, Georgia, March 29, 2018. US Army/Spc. 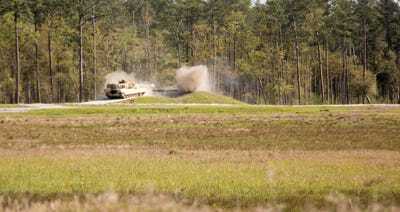 Leo JenkinsTroopers with Delta Tank Company, 6th Squadron, 8th Cavalry Regiment, 2nd Armoured Brigade Combat Team, 3rd Infantry Division, move to firing position during unit gunnery at Fort Stewart, Georgia, March 29, 2018. Soldiers from Delta Tank Company of 6th Squadron, 8th Cavalry Regiment, 2nd Armoured Brigade Combat Team rolled out their newly acquired M1A1-SA Abrams tanks for gunnery drills at a range at Fort Stewart on March 29. 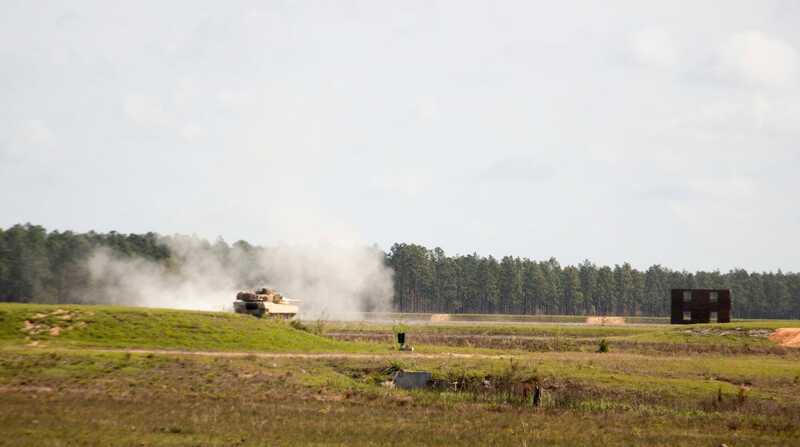 US ArmyTroopers with Delta Tank Company, 6th Squadron, 8th Cavalry Regiment, 2nd Armoured Brigade Combat Team, 3rd Infantry Division, fire a main gun round at a target during unit gunnery at Fort Stewart, Georgia, March 29, 2018. The unit’s 87 M1A1 Abrams tanks come with the situational-awareness configuration, an upgrade to restore older M1A1 tanks to like-new condition and to enhance the tank’s armour and add technology to boost crew awareness on the battlefield. Delta Tank is the 6th Squadron, 8th Cavalry Regiment’s only tank company, and it is the first unit from the brigade to test their new tanks. The live gunnery exercise they took part in is meant to certify the crew of each combat vehicle. That certification is required to move on to larger, more complex exercises. US ArmyTroopers with Delta Tank Company, 6th Squadron, 8th Cavalry Regiment, 2nd Armoured Brigade Combat Team, 3rd Infantry Division, fire a main gun round at a target during unit gunnery, at Fort Stewart, Georgia, March 29, 2018. US Army/Spc. Leo JenkinsTroopers with Delta Tank Company, 6th Squadron, 8th Cavalry Regiment, 2nd Armoured Brigade Combat Team, 3rd Infantry Division, fire a main gun round at a target during unit gunnery at Fort Stewart, Georgia, March 29, 2018. The Spartan brigade, as the 2nd Brigade Combat Team is known,took part in the invasion of Iraq in 2003 as an armoured brigade combat team and was part of the force that captured Baghdad. In 2015, amid force drawdowns and restructuring, the unit was converted to light infantry. Now an armoured brigade again, the 2BCT has added more than 200 armoured vehicles, including 87 tanks, 138 Bradley fighting vehicles, and 18 M109 Paladin self-propelled howitzers. US Army/Staff Sgt. Nathan C. BerryA M1A1-SA Abrams from D Troop, 6th Squadron, 8th Cavalry Regiment, 2nd Armoured Brigade Combat Team, 3rd Infantry Division, fires the first round from its main gun while in a battle position during the troop-gunnery qualification at Fort Stewart, Georgia, March 29, 2018. The Army wants to add armour in order to field more rotational deployments, particularly to Eastern Europe, where NATO members border Russia. Army Chief of Staff Gen. Mark Milley said in mid-March that his goal was get 66% of the Army’s brigade combat teams to the highest readiness level over the next three years. US Army/Staff Sgt. 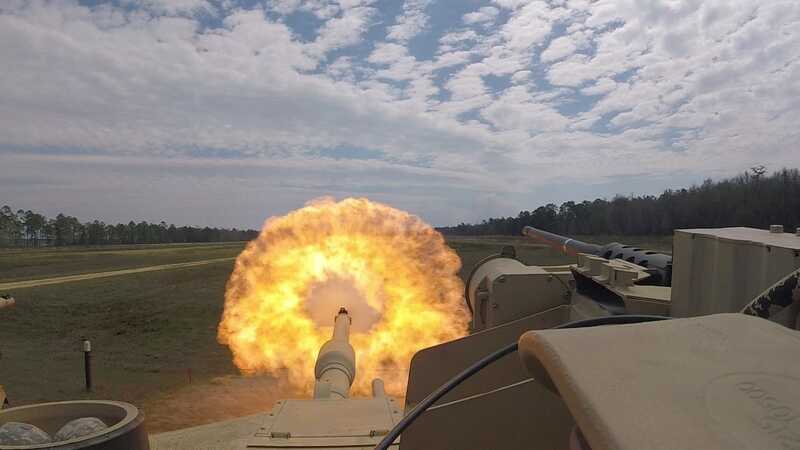 Nathan C. BerryA M1A1-SA Abrams from D Troop, 6th Squadron, 8th Cavalry Regiment, 2nd Armoured Brigade Combat Team, 3rd Infantry Division, fires a main gun round at enemy target during the troop-gunnery qualification at Fort Stewart, Georgia, March 29, 2018.